U.S. vs. Europe - Which Racing is Better? You have total amnesia. All you are told is your name and that you loved Thoroughbred racing, but you don't know why and cannot recall actually following the sport. You don't even know if you live in the United States or Europe. You have to start taking baby steps and learn to love racing all over again. You decide to spend a year in the States and a year in Europe and then decide which racing you like best and where you want to live. BEAUTY - A big advantage to Europe to start off. The beautiful, lush grass courses, the maze of white railing, uphill and downhill runs, and horses, without lead ponies, turned out in impeccable condition, escorted by well-dressed lads (grooms). Whether at Royal Ascot, Epsom on Derby Day, Glorious Goodwood, or small tracks like Salisbury and Bath, racing in England is a canvas of gorgeous colors and images. And there is nothing as dazzling to the eye as the Longchamp's magnificent grass course or the vast expanse of the Curragh. Several of the American tracks do present spectacular backdrops, such as the San Gabriel Mountains beyond Santa Anita and the miles of gentle rolling hills beyond Keeneland, and those tracks with scenic infields, adorned by lakes, flowers, and a variety of greenery and birdlife. But the racetracks themselves cannot compare with those in Europe. And the American horses, leaning on their lead ponies as if they were security blankets, are not as pleasing to the eye as the Europeans as they ramble down the stretch after being let go by their lads, striding out magnificently on their way to the starting gate. PURITY OF THE SPORT - Once again, the advantage goes to Europe. No medication, standard shoes, strict whip laws, stiffer penalties, and less tolerance for riding infractions make European racing far less tainted than American racing and more of a true sport. By racing on the grass (and rarely is it as firm as in America), you have much fewer catastrophic injuries. The safety advantage in Europe also is helped by the nature of the sport, where the horses go far slower for the first three-quarters of the race than they do in the States. American racing is going through rough times, a good part of it due to its image following several high-profile fatal breakdowns in Triple Crown and Breeders' Cup events. The inability to determine whether those injuries were caused by the racetrack or unsoundness or overuse of medication hasn't helped, opening the door for fanatical organizations to condemn racing and demand its abolishment. Also, American stewards are known for their inconsistency. Different rules and tolerance levels apply at different racetracks, and fans are often left bewildered at some of the decisions. The British stewards also face the wrath of the public on occasion, but England at least has a ruling body (British Horseracing Authority) to regulate the sport and enforce its rules, which keeps the game consistent. England has had a governing body for 250 years. Each track and each state in America are entities unto themselves, establishing their own rules. That has become evident recently by the vast discrepancies in suspension time for the same medication violation, and the Marx Brothers-like craziness in California. And to Europeans, it is appalling to think that almost every American 2-year-old first-time starter runs on Lasix, which originally was meant to be given only to horses who had previously bled. Now, babies get Lasix first crack out of the box. That, along with permissive medication like Butazolidan, is one of the reasons Europeans over the years have referred to Americans as "doped-up horses." But it must be pointed out that every European starter in last year's Breeders' Cup raced on Lasix and/or Bute, with the first two finishers in the Classic racing on both. Conduit and Eagle Mountain, one-two in the BC Turf, raced on Bute only, as did BC Mile winner Goldikova. And England had its own high-profile drug violation this year when trainer Nicky Henderson not only had a horse come up positive for a prohibited substance, but a horse owned by The Queen. He was handed a three-month suspension by the British Horseracing Authority. High-profile drug suspensions, however, are much more commonplace in America. WAGERING/TRAINING - Although no one loves to bet more than the English, who have bookmakers of all kinds to turn to, and off-track betting was a fixture in France before it came to America, the American horseplayer still has it so much better than the Europeans. In Europe, you basically have to know the horses and must rely on published reports from the gallops as to how a horse is training. The past performances (if you can call them that) in the Racing Post and Paris-Turf provide little pertinent information to analyze, especially compared to the morass of statistics in American past performance lines. In America, where there are more types of bets, one can decipher all the data and have a pretty good idea how a race is going to be run - who will be where, how fast the pace will be, etc. Getting back to training, American horses are an open book, with their works listed each day online and in the Daily Racing Form, and in a horse's past performances. You can have a dozen works listed for a first-time starter, whereas in Europe young horses are judged by the buzz coming out of the yard. During the Triple Crown and Breeders' Cup, the media scrutinizes over the works of all the participants and provide daily reports on how the horses are working. TVG and HRTV also have works shows each day, so the average fan can watch them on TV and make their own judgments. In Europe, horses are cloistered away in private yards, with the trainer being the ultimate ruler of his domain. No one gets anywhere near his horses without an invitation. Works can be conducted over the expansive gallops at Newmarket or on private property, such as Ballydoyle, or in the vast network of training tracks at Chantilly. Aesthetically, training at Newmarket and Chantilly is far superior to American horses training on the racetrack, but the latter provides more knowledge and information to the bettor and is so much more accessible to the media, who then go back to the barns and discuss the works with the trainers. Fans attending "Breakfast at Belmont," for example, can watch the works and gallops right next to the trainers who congregate inside and outside the café each morning. Fans at Santa Anita can do the same at "Clocker's Corner." This is where Europe and America are truly separate worlds. From a fan's and a media member's perspective, America wins this hands down. WATCHING THE RACE - As mentioned before, beauty-wise there is no comparison, but for the fan/bettor, watching the race is far more enjoyable in America. The horses are closer to the fans and easier to see and there are fractions posted to tell you how fast or slow they're going. American horses have more of a distinct running style, so you know if they are running their race or a being forced to deviate from their normal style of running. Horses make their moves at different points in the race, making for more excitement throughout the running and more strategy. In Europe, there are races where the fans in the grandstand cannot see the horses at all early on, or the horses are so far away (like on the Newmarket straight) they are nothing more than specks in the distance. Individual horses also are more difficult to spot, because the fields normally are so tightly bunched all you can see is a cluster of jockey helmets. It's all about waiting and waiting, and then unleashing your horse's run at the right time, usually between 1 1/2 and two furlongs out. In Europe, you can often tell the winner a long way out by how much hold the rider still has on his horse. That happens less frequently in America, where horses are able to make long sustained runs and are under pressure much farther out. Many stretches in Europe are so long you can't get a good look at the horses as they turn for home. But those long stretches do favor the European bettors, because horses have more time to extricate themselves from traffic problems or recover from bumping incidents. And as everyone knows, European finishes as a whole are much closer and you rarely see the kind of romps you see in America. So, all in all, this category also goes to America. BEST HORSES -- This, of course, is pure opinion and difficult to say, considering most of America's best horses run on dirt and all of Europe's run on grass. Because of the advent of synthetic surfaces in America, it has divided the sport as we knew it, and determining who the top horses really are has become more difficult. By going from two outlets - dirt and grass - to three, it has diluted the talent even more, or at least our perception of talent. Each place has its core of super heroes from the past. Each also has its own problem of finding new ones, due to the early retirements of its classic winners. 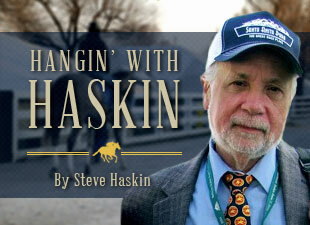 The days of the true sportsmen racing their best horses for three or four years are gone. There is so much money at the upper levels of the sport and such a craving for multi-million-dollar stallions, racing in America and Europe has become more of a stopover on the way to the breeding shed, where new well-bred and lightly raced horses are churned out to perpetuate the cycle. Like moving in a constant circle, it just leads right back to where it started. To further their gluttony, some major breeders in America and Europe send a good number of their stallions to the Southern Hemishpere to be bred. Unlike the past, when stallions basically were bred to 40 mares a year, some are now bred to several hundred. Europeans can boast of their dominating record in the Breeders' Cup Turf over the years and their success in the BC Mile. And now with the one-two finish of Raven's Pass and Henrythenavigator in last year's Classic over a synthetic surface, you can bet they will return in droves to Santa Anita this year with horses for both the turf and "dirt" races. Will America find another Tiznow to restore its reputation in the Classic? America returned the favor this June when Wesley Ward took six horses to Royal Ascot and really stuck it to the Europeans right in front of The Queen, winning two stakes and just getting beat a head in another - the group I Golden Jubilee. And he did it with dirt horses. So, let's just say that the two worlds have become even closer since last fall and call this category a wash. The Euros are better on turf and the Americans are better on dirt. ACCESSIBILITY - When it comes to being able to see live racing, Europe has a big advantage, but only because each country is much smaller than the U.S. and fans, especially in England and Ireland, are no more than a few hours drive or a relatively short train ride to any track. Because a racing fan from England, for example, can drive or take a train to the Derby or the Guineas or Royal Ascot, you have to give the edge to Europe. So, what is the decision? Do you go with the sheer beauty, purity, and accessibility of European racing or do you prefer the vastly superior information provided by American racing, along with the easier viewing of the races and access to the trainers? Not being much of a bettor and interested more in the sport itself and the horses, I think for the most part I will spend the mornings on the backstretch in America and then hop in my private jet and go to the races in Europe in the afternoon. I'm not a jump follower, so it's all U.S. in the winter. After the Triple Crown, I will spend all my time in England during the Royal Ascot meet and then catch the Irish Derby. And I can't miss Glorious Goodwood in July or the King George at Ascot. During August, I will spend all my mornings and afternoons at Saratoga (cannot pass up breakfast at Beverly's). In mid-September, I'll spend most mornings at Chantilly (the most heavenly spot on Earth for horses and cathartic for humans) and go to the races in England and Ireland, then return to France for Arc day (nothing like it) before heading back to America for the Breeders' Cup. What? You say it can't be done? Hey, it's only a silly blog. I can do anything I want.